I think it's time we blow this scene. Get everybody and the stuff together. OK. 3 2 1. Let's jam! Erratic flashes blast the black and white canvas, synchronized in harmony with the pulsating sound of horns and drums to reveal the title: Cowboy Bebop. Composer Yoko Kono's opening theme, "Tank!," begins its eclectic mixture of bebop jazz, an incandescent barrage of instruments each punctuating the visuals to stylized effect. The jazz influence, not only prevalent in the soundtrack, also carries through to the execution of the visuals; the colors and camera movement strengthen the exuberance of the music's hip, free, and expressive spirit. The palette of pink, blue, yellow, green serves as a backdrop to the black silhouettes of characters, which are repeatedly paired with free-form animated text and the Cowboy Bebop title. Squares and rectangles dominate the screen, in varying graphic layouts–splitting the composition some times, and at other times separating frames to provide spacing for the credits. Incorporated throughout, a series of action shots congruous to the cadence of the music provide a glimpse at some of the show's symbolism: martial arts fighting, billows of cigarette smoke, frantic running, various spaceships interjecting, guns firing. The art direction for the title sequence of Cowboy Bebop is reminiscent of Sejun Suzuki's Tokyo Drifter (a 1966 film made during the Japanese New Wave or Noberu Bagu) and also from the pop art movement. The primordial element, however, is the bebop jazz influence (hence the term's inclusion in the show's title and the labeling of the show's episodes as "sessions"). The title credits even act as a manifesto supported by the meandering text in some shots: "They must create new dreams and films by breaking traditional styles. They are sick and tired of conventional fixed style jazz. 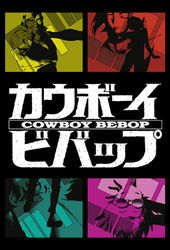 ...the work, which becomes a new genre itself, will be called COWBOY BEBOP, will play without fear of risky things." The strong images coupled with the aural landscape of trumpets, saxophones, trombones, drums, and double-bass create a marvelous introduction to one of Anime's seminal works.